This story was written by CNET's Tom Krazit. Twenty-five years after the debut of the Macintosh, the product that is the soul of Apple is not necessarily its vehicle to the future. It was a quarter-century ago that Super Bowl XVIII viewers saw the now-famous introductory ad for Apple's Macintosh, formally released two days later. Apple had announced back in 1983 that the Macintosh was coming, but for many, that Sunday was their first look at the product that would drive Apple to new heights in the personal computer industry and usher in the graphical user interface as the standard way for regular people to interact with their computers. These days, Apple is in a very different place. The company sold ten times as many iPods and iPhones in its first fiscal quarter as it does Macs; and it was a great year for the Mac. CEO Steve Jobs was so aware of this transformation in recent years that he announced in January 2007 that Apple Computer was no more; it's Apple Inc. these days. More and more, it seems the iPhone is the future of Apple. Or, at least, the cutting-edge technology inside Apple, the project that everybody wants to work on, and that competitors strive to emulate. So what does that mean for the Mac over the next quarter century?. Click here for CNET's complete coverage of Mac at 25. In all honesty, few of us know. Certainly it would have been difficult for most people in the late 1980s watching Michael Douglas in Wall Street talk into a "mobile" phone the size of Shaquille O'Neal's basketball shoe to envision using a sleek handheld phone with all the computing power of the PCs of the day, and then some. As his daily segment for CBS station KCBS in San Francisco, Larry Magid spoke Thursday with co-anchors Patti Reising and Jeff Bell on the 25th anniversary of the Mac about what he thought back then and what the future holds. Click here to hear the broadcast. But the Mac is still very much part of Apple's mission: it ends every press release with the stock paragraph declaring "Apple ignited the personal computer revolution in the 1970s with the Apple II and reinvented the personal computer in the 1980s with the Macintosh. Today, Apple continues to lead the industry in innovation with its award-winning computers, OS X operating system and iLife and professional applications." So let's consider the near-term future of the Mac; say 5 to 10 years from today. 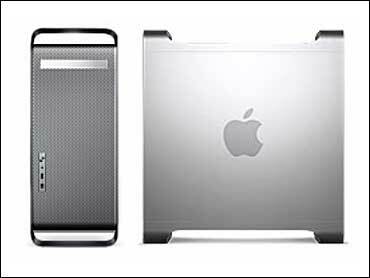 One look at our gallery of Macs through the years is enough to demonstrate just how far the personal computing industry has come from the days of bulky plastic and tiny screens to products like the MacBook Air. Desktop computers seem likely to get smaller and larger; smaller in that people will consider even a Mac Mini too big for their home electronics cabinet, and larger in that they will get assimilated into various other household gadgets, such as televisions or home security systems. The other trend that will eventually come to roost is the home server, which is not for the faint of heart at the moment but seems eventually destined for every home. Apple will have some answer to that market as it develops, and they probably won't call it a server. Smartphones like the iPhone are indeed all the rage, but they aren't going to displace notebook computers with real screens and real keyboards. Reasonable people can disagree on how big those screens and keyboards might be, but any real work or real entertainment will require something larger than a handheld gadget. The MacBook will continue to evolve with existing features like solid-state drives and multitouch gesture inputs joining science-fair projects like flexible displays and advanced voice-recognition technologies. One of the main questions around the Mac in 2008 was whether or not Apple would bow to a coming recession by either cutting the price of its MacBooks or introducing a so-called Netbook. It's hard to imagine Apple fighting with its PC counterparts on the bargain shelves with the basic MacBook lineup, but if the cost of computing power continues to decline as performance flatlines, cost-cutting might happen on its own without poisoning Apple's margins. And few would be surprised to see Apple come out with its own take on the Netbook if the trend toward that style of computing keeps going, recent comments notwithstanding. There doesn't seem to be anyone able to step up and play third-fiddle to Microsoft and Apple in the personal computing operating system market within the next three to five years. These days, Linux development seems concentrated on the smartphone market, where it can be found at the heart of new products such as Google's Android, LiMo's software, and Palm's WebOS. One of the strongest selling points for the Mac at present is the iLife suite, and it will be interesting to watch how Apple evolves that set of software. As the way we use computers evolves, Apple will need to tackle those new usage models in iLife: iPhoto, iMovie, and GarageBand will probably stick around, but iWeb and iDVD already seem like they could be replaced with more forward-looking products that help manage your home or car, for example. Also, Apple will need to continue to improve the way its software works with the Internet, expanding on concepts like MobileMe. It's not hard to imagine the Mac of the future as a relatively thin client that does most of its work over a high-speed Internet connection, backed up by the aforementioned home server appliance that stores everything. Simplifying that kind of setup could be a huge part of iLife '12. To be clear, these are all pretty safe evolutionary bets. That's sort of the point: the Mac is already a mature product, and over time it becomes harder to make revolutionary changes to products that have entrenched usage patterns. That kind of action is happening in the mobile computing market, as the iPhone and iPod Touch turn into Apple's most influential products. Apple's recent decision to file for a trademark on the term "OS X," as distinct from Mac OS X, shows that in the future the company wants to draw an even clearer line between the Mac and the rest of its computers. But what do you think? How will the Mac evolve over the next 25 years? Or is the Mac of the future today's iPhone? Please leave your suggestions below, and also check out the rest of our package on the 25th anniversary of the Mac, complete with reader stories, memories from the original Mac team, and pictures of Macs throughout the years.